The Scale Model Challenge is an annual convention organized by the Scale Model Factory, a hobby club for scale model enthusiasts. In 2012 the event took place on October, 14th in the NH Convention Centre Koningshof in Veldhoven near Eindhoven in the Netherlands. A brief writeup on how to paint the Clan Fire Mandrill Kindra Kline scheme. A brief writeup on how to paint a Clan Burrock scheme. A brief writeup on how to paint a Clan Star Adder scheme. A brief writeup on how to paint a Clan Ice Hellion scheme. A brief writeup on how to paint a Clan Steel Viper scheme. A brief writeup on how to paint a Clan Mongoose scheme. A brief writeup on how to paint a Clan Ghost Bear scheme. A brief writeup on how to paint a Smoke Jaguar scheme. 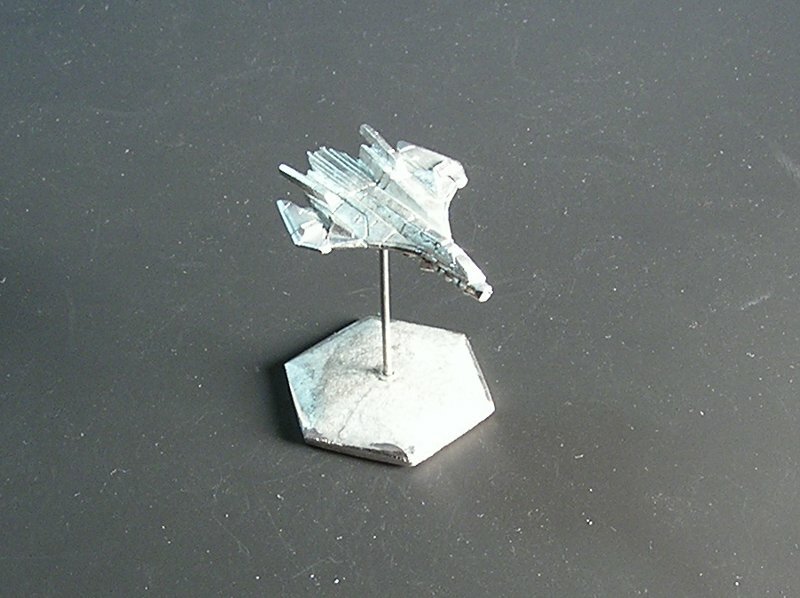 Foxbat's simple steps to making a D9-G10 variant of the Duan Gung. Psycho takes you through his build of the BGS-7S Barghest. CSO artists review the new plastic Thor and Loki miniatures. CSO Artists take 1st, 2nd and 3rd place in the Machines of War category of the painting contest! Welcome to this behind-the-scenes look at kitbashing the Pulverizer ‘Mech for the CSO Diorama at GenCon Indy 2008. I will start off by saying it was an honour and privilege to be entrusted with the task of bringing an as yet unknown ‘Mech design to life. Thanks go out to Ray and David (along with the other PTB, and Brent Evans) for making it possible. 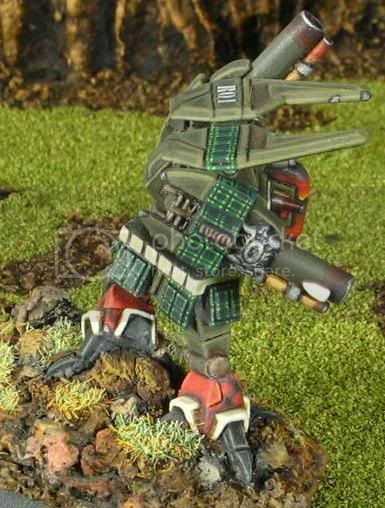 Notable units throughout the Innersphere use various patterns of tartan; arguably, the most prominent of these units include the Star League Royal Black Watch and the Northwind Highlanders. For this tutorial, we will examine techniques for painting the tartan of the Black Watch, also known as the Government set. The techniques demonstrated in this tutorial are applicable to planning and painting tartans of other patterns in addition to that of the Black Watch. In this article you will dive into the wonderful world of brushes. Please do not expect to come out an all knowing guru after reading this, it is just a basic primer on types of brushes and their care. What I do hope you get from it is the fact that your brush selection and care are as important as what paints you use. Conceptually, painting scales isn’t all that different from any other kind of layering; in fact, it’s very similar to jewelling. Basically, you’re just building up a range of one color—green, for example—from dark to light, but in a pattern. There are several ways of doing it, but I personally consider the following to be the best balance between detail and expedience. There are lots of patterns you can use; round, irregular, “shield” shaped, diamonds, etc. It’s a matter of taste. For our example, we’re going to go with green shield-shaped scales. I’ve put a simple image in with each step to make it a bit easier to follow along. People have asked me quite often how I produced the muzzle burns and weathering on my minis. Well I used Chalk. Now one thing led to another and in these two video sections you will see where it led to when some one challenged me to paint an entire mini in chalk. So sit back and enjoy and look for future video feeds from your basic skills to some really out of the box stuff. This Video continues the Chalking procedure up to the point of being ready to detailing the rest of the mech. This video will cover the use of chalk as a base coat for you mini's From basic application to how to work the chalk to create a fade. This Video will cover one way I prepare a mini for painting for the CSO site. Prep can be one of the most important steps and is a skill I am constantly improving on. You will also learn about the use of a wet pallet to extend the life of your paints and a few other fun tidbits. You will also get to see how even us CSO artist are only human. Welcome, I have had numerous people ask me what techniques I use when I build the terrain that I use with my gaming group. So, when I took on my latest, greatest and LARGEST terrain project I decided to attempt to chronicle the experience so that other gamers out there who are interested in building their own terrain could see how it is that I do it and maybe gain some new ideas for themselves. Following is essentially a step-by-step description of how I have built a large 8' x 8' terrain board for use at GenCon 2003. Article on how to set up lighting for mini photography. Everyone's had them...The all too common and continuously critiqued mold lines. A great paint job can't cover them up, and as you'll see below, the worst casts and misalignments can really be a hassle if you don't know how to attack the problem. Begin by preparing all parts for assembly. Cut them from the sprues, clean up mold lines with the exacto and needle files. Score all joints with the exacto knife. When finished, scrub the parts with the white vinegar and toothbrush. This article discusses techniques that can be used to drybrush your miniatures. This article discusses techniques that can be used to paint Battle Armor miniatures. This article discusses techniques that can be used to add antennas to your BattleMech miniatures.